Scott’s centenary year fell in 1979. The man himself missed it by only nine years. In those pre-compact disc days the ‘celebrations’ passed with hardly a tremor of recognition. Things have improved dramatically in the last five years. 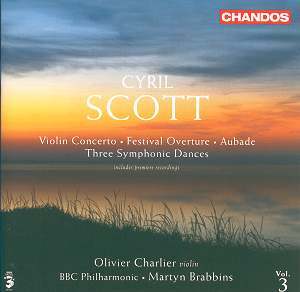 The BBC have broadcast the Violin Concerto and Dutton have now reached the third double volume in their complete traversal of the Scott solo piano music. There are other CDs too including one from the Austrian Genuin label. The two earlier Chandos volumes have now been joined by the return of John Ogdon’s pioneering Lyrita recordings of the two piano concertos. In addition Chandos are busy recording the Cello Concerto and Symphony No. 1 for volume 4. The Cello Sonata is also being recorded. The Festival Overture is reminiscent of the diaphanous textures of the First Piano Concerto and touches on territory mapped out by Debussy’s Faun. It’s a gorgeously lush impressionistic piece rising to a rather redundant choral conclusion. The music began life as yet another response to Maeterlinck; in this case the Princess Maleine. Scott wrote a number of other Maeterlinck-inspired works including Aglavaine et Selysette and Pelléas et Mélisande. The Violin Concerto is a sultry and yet more subtle verdant outpouring which should appeal to anyone who loves the Szymanowski First Concerto or the Violin and Cello Concertos by Bax and Delius. The worldweary sighing of the violin solo at 4:50 in the first movement must surely have influenced Bax in the writing of the Cello Concerto. A further linkage – this time with Delius – is that the Scott was premiered by one of Delius’s favourites, May Harrison. The Aubade has been done before (on Marco Polo) but not as well as this. It’s another evocative work strongly suggestive of Bax’s classical phase (Nympholept, Enchanted Summer, The Happy Forest and, most strongly of all, the symphony Spring Fire). The Three Symphonic Dances continue a thread running through the first two volumes: Scott’s symphonies. These Dances represent all we are ever likely to hear of Scott’s four movement Second Symphony. It seems that the first movement of the symphony has disappeared completely. I can discern nothing of the dance in the hyper-romantic Tchaikovskian central dance but both the outer movements do refer to dance rhythms even if they are ecstatically glimpsed through a refracting glass: part Chabrier and part Franck (Psyché). Another strong entrant in the Scott renaissance which continues to assault both ignorance and the accumulation of ill-informed assumptions about this fine composer.